Side Chair Made Stylish with Robert Allen Fabric - Sew What? Sew Anything! 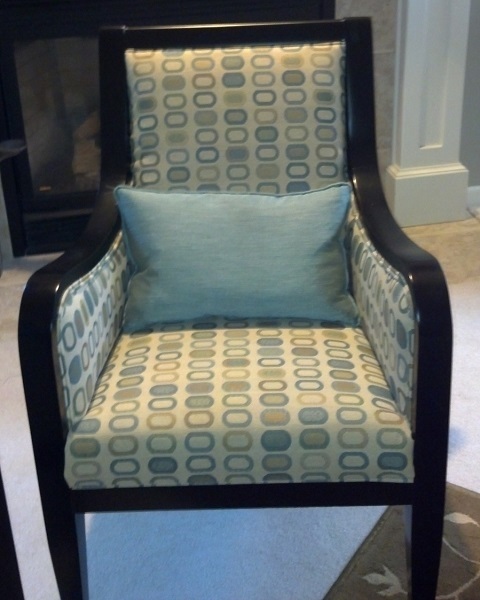 This chair uses a delightfully contemporary Robert Allen fabric for the upholstery. The client totally transformed the look of this chair by having the dull wood painted with high gloss black paint. There are two of these chairs that flank the home’s fireplace. These two chairs, new window treatments, and some paint transformed this couple’s family room into a great warm room for them to relax in and enjoy at the end of the day.